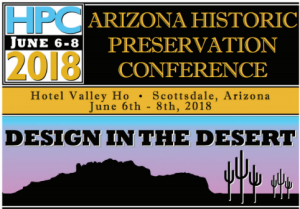 The lively and well-attended Arizona Statewide Historic Preservation Conference was held earlier this month at the Hotel Valley Ho in Scottsdale. The Center for Digital Antiquity organized two sessions for the conference. One of the sessions highlighted the Digital Archive for Huhugam Archaeology (DAHA) project underway at the Center in collaboration with the Amerind Museum , ASU Libraries, the ASU Center for Archaeology and Society, other ASU scholars, Pueblo Grande Museum, the City of Phoenix Archaeologist office, other public agencies. Also involved are Archaeology Southwest, Desert Archaeology, Statistical Research, Inc., and a number of other CRM firms in southern Arizona. Organized by Leigh Anne Ellison, who summarized the various aspects of DAHA, presentations also were made by David Martinez, Frank McManamon, and Adam Brin. Martinez described the dialogue with tribal communities as part of the project. McManamon summarized the building of content for DAHA in a collection in tDAR, the Digital Archaeological Record. Brin summarized research on natural language processing and “text mining” as part of the project that will enable more detailed research on the rich body of technical reports and other documents assembled in the digital archive. The other Digital Antiquity session, organized by Frank McManamon, took on the topic of “Designing and Carrying Out Digital Curation for Data Management, Research, and Sharing.” Presentations by Bill Doelle (Archaeology Southwest), Sharlot Hart (NPS), Lauren Jelinek (Phoenix Area Office, Bureau of Reclamation), and Teresita Majewski (Statistical Research, Inc) described the work being done by their organizations to make the large amounts of digital data that have been and are being created by contemporary archaeological investigations discoverable, accessible, usable, and preserved. A lively discussion ensued among the panelists and with the overflowing audience. An important point emphasized in the discussion is that the mass of data and reporting that has been created by half a century and more of CRM and rescue/salvage archaeology, plus the new data being produced now is not being effectively used. These legacy data and reports are a “gold mine” that need to be taken into account using digital methods and techniques to find, access, and use the information they contain. Just last month we celebrated a decade since the first record was created in tDAR. In this post, we report on more recent events and express our thanks to people important to Digital Antiquity and tDAR. At our meeting of the Board of Directors earlier this year, Dr. Tim Kohler (Regent’s Professor at Washington State University) and Dr. Dean Snow (Emeritus Professor at the Pennsylvania State University) announced that they would not seek reappointment. Kohler and Snow are among the founding members of the Digital Antiquity Board. Before that, they were members of Archaeo Informatics, which was established to preserve meaningful archaeological data in its many forms and the metadata necessary to keep these data useful and to provide scholars and the general public with broad and easy access to these data. Tim and Dean were among the co-PIs for the first development grant provided by the Andrew W. Mellon Foundation that enabled the establishment of Digital Antiquity and provided funding for the development and early growth of tDAR content. They have been active Board members providing advice and perspective aiding in the growth of both Digital Antiquity and tDAR. We greatly appreciate the time and expertise they have shared with us and hope we can tap them for more advice, if less frequently, in the future. Turning to staff changes that occurred earlier this year, we are delighted to welcome three new members of the Digital Antiquity staff. Tyler Sutton began as our newest digital curator in late March. No stranger to Digital Antiquity or tDAR, Tyler joined in August 2016, as a member of our initial “class” of student veterans hired to work on the Digital Veterans Curation Program, which is part of the US Army Corps of Engineers VCP that focuses on rehabilitating archaeological physical collections so they are available for modern archaeological investigations. In mid-April, Lani Harrison joined Digital Antiquity as Administrative Specialist. Lani is making quick progress through the administrative backlog figuratively piled up since the departure of her predecessor. Our newest staff arrival is Cole Von Roeder, a rising senior in the School of Human Evolution and Social Change interested in a career in archaeology. Cole is also a student-veteran and is working on adding digital files from the VCP laboratories to tDAR where they will be accessible and useable for education and research. We send our thanks and best wishes for success to two staff members. Herminio Meneses, another of our first group of student-veterans who worked on Digital VCP. Herminio, a senior with only a few courses left to graduate, is a member of the National Guard and was deployed a week ago to the Arizona border on orders of the governor. We hope for his safety and that the wifi service he can access down south is strong enough to enable him to take the ASU online courses he needs to complete his degree. Lastly, we offer congratulations, as well as thanks and best wishes, to Alexa Rose, one of our student workers who graduated this week with a major in Classics and Anthropology. Alexa helped with drafting metadata records and curation of report files for the Digital Archive of Huhugam Archaeology, one of our NEH-funded projects. Alexa will be continuing her education in Classical Archaeology, starting a Master’s degree at Brandeis this fall. We wish her the best of luck. Request access (will require a free registration). Once completed, we will send you a message within one business day with a link to edit the abstract and upload the record. Scroll down and edit or enhance any of the metdata. Click on the green "add files" button under "Attach Document Files" and follow the prompt to upload a copy of your paper, poster, or associated data . If you are adding multiple files (e.g. your paper, a copy of your presentation, and a dataset) you will probably want to create a project. You may save your work at any point along the way, but when your edits are complete, make sure to change your resource's status from "draft" to "active". 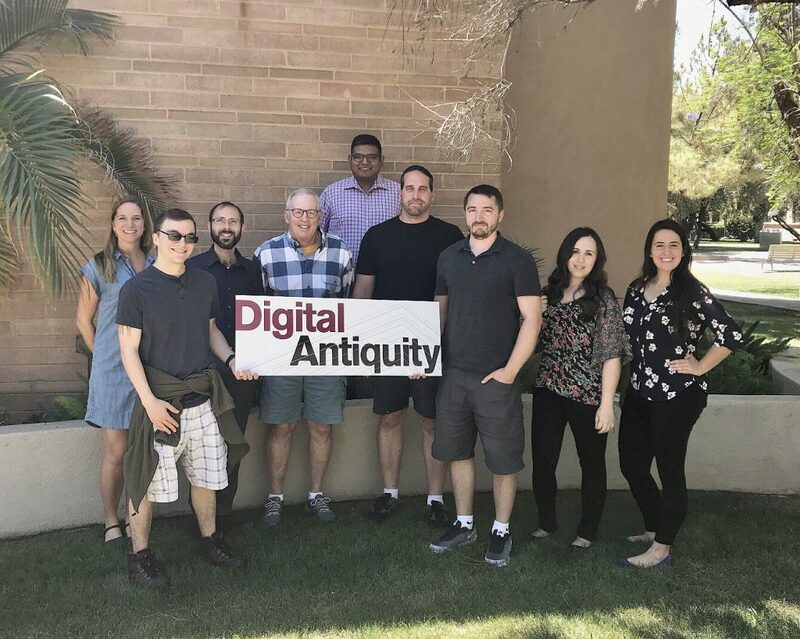 As always, please call or email Leigh Anne at (480) 965-1593 or laellison@digitalantiquity.org with any questions along the way! Were you a presenter in 2015 (San Francisco), or 2016 (Orlando) but haven't uploaded your presentation yet? Not to worry--those abstracts are also in tDAR and can be found in the search bar at the top of this page too. Help other researchers find and cite your SAA presentations by making them available today! Additionally, the tDAR SAA Member Benefit allows retired members, student members, members from countries with discounted rates, and members from Tribal Historic Preservation Offices to upload ten files (up to 100MB) annually to tDAR. Contact membership@saa.org to request your voucher. Digital Antiquity is proud to announce that tDAR is now a formal member node of the Data Observation Network for Earth (DataONE). DataONE enables universal access to data and also facilitates researchers in fulfilling their need for data management and in providing secure and permanent access to their data. DataONE offers the scientific community a suite of tools and training materials that cover all aspects of the data life cycle from data collection, to management, analysis and publication. DataONE, like tDAR has a deep interest in data archiving, access, and use, as well as reproducible science. Researchers using DataONE’s suite of tools will now be able to discover archaeological materials that have been contributed to tDAR as well as the approximately 1,000,000 files currently part of DataONE. We’re excited to be travelling to Lincoln, Nebraska later this week for the 74th Annual Plains Anthropological Conference. We hope that you will stop by our booth in the exhibit hall to speak with a digital curation expert about your digital archaeological information, to enter our drawing for a chance to win a digital preservation package, or just to grab some tDAR swag and say hi! You can also see our poster “Curating and Preserving Digital Archaeological Data: A Guide to Good Practice” in Salon B/C between 2-4PM on Thursday, October 13th. If you are in the Lincoln area and want to learn more about tDAR, but won’t be attending the conference, please send an email to laellison@digitalantiquity.org to set up a time to meet. See you soon! We recently made a change to the way we share new resources in tDAR. In the past, our Twitter account announced each new resource as it was made live. Moving forward, we’ll do a weekly round-up and let you know what new resources were added to tDAR during the previous week, with a link to a collection in tDAR where the enthusiastic user can see them all! Our weekly post will attempt to highlight the breadth of new materials by featuring a few of the newest resources. This week’s post will play catch up and cover all the resources made active in tDAR over the last month. There is a wonderful variety represented in this group! For example, there is a new set of photographs of Norse artifacts from Skútustaðir, including several pipe stem fragments and a die. The Mimbres Pottery Images Digital Database also added more images last month, such as this Style III bowl. The Eastern Faunal Working Group made available several new coding sheets and ontologies from the Modoc Rock Shelter Site 1980 excavations as part of their efforts to bring together regional faunal data for synthetic analysis. Coding sheets and ontologies are used alongside data sets to synthesize raw data using tDAR’s data integration tool. There are also a few new resources from Quantico Marine Corps Base. If you are interested in the history and use of the base you might find this resource a worthwhile read. Finally, a paper and data related to gender equity in archaeology are now available! To see all the resources made active in tDAR for the period 11/02 to 12/11 click here. Selected reports from New York State are now available in tDAR, thanks to the New York State Museum and the Public Archaeology Facility at Binghamton University. The collection currently contains over 30 reports from 16 different counties, with plans to add more resources in the future. The reports cover CRM work done over the past three decades and will be a valuable resource for those interested in prehistoric and historic archaeology of New York State. Browse the New York State Museum and the Public Archaeology Facility, Binghamton University Archaeological Collection today! Contact us at via email at SAA2015@tdar.org or by phone at (480) 965-1593 and let us know your name, presentation title and how many files you plan to upload (up to 3/30MB). We will give you access to the abstract record(s) and email you a voucher to cover the cost of your upload. Click “Next: Review & Choose Payment Method.” Your credit will be added to your account and you can begin uploading files! Navigate to your abstract record, either by locating it from among your resources under the “browse resources ” section of your dashboard (accessed by clicking “dashboard” along the top menu), or by searching for it on the search page. From your abstract page, select “edit” from the top menu. You may now add or change any of the metadata or keywords as well as attach a file. In 2011 the Center for Digital Antiquity used information about archaeological reports found in the National Archaeological Database (NADB) to creates over 350,000 tDAR citation records. These new tDAR records improved this information with enhanced metadata and a display of geographic information that enable for easier discovery and access. In tDAR these records can be edited and improved; for example, if a digital file of the report described in the citation record is available, it can be uploaded and added to tDAR, thereby greatly enhancing accessibility to the information. Many interesting human details about archeological investigations are rarely published. The stories exist in field notes, correspondence, anecdotes and rumors about the personal and professional relationships of those involved, the behavior of the crew, the weather, the attitudes of the local landowners, and vehicle breakdowns and other nuisances of field work. Particularly for the Moorehead expeditions, there is more to the history of archeological investigations at the Buried City than appears in published reports. Part of the story lies in the methods of archeology some 60-80 years ago, and part lies in the relationship of two strong-willed scholars of different backgrounds and, apparently, different values. The untold story explains a significant loss of data that occurred even before the passage of time between Moorehead’s last expedition in 1920 and the current project in 1985. This story is so important to the history of archeology on the Courson Ranch that we present it in some detail here. Hughes contacted Digital Antiquity and offered to scan a copy he had of the report, which he then sent to us. We were able add the digital copy to the existing tDAR record and add additional metadata. This means that this once hard to access record of archaeological practice is now easily find-able and accessible thanks to NADB, tDAR, and Hughes. We’d like to encourage other archaeologists and tDAR users to please get in touch if they have access to a copy of one of the citation-only records already in tDAR. A digital curator can work with you to add the file to the repository at no cost. Do you or your organization have multiple reports or a legacy of archaeological work that you want to see preserved? Please get in touch to learn about the services that Digital Antiquity can provide so you can turn your archaeological materials into a long lasting legacy. What are data papers? Data papers are a new type of publication that combine a narrative short paper and a data set (such as lithic artifact attributes, chemical/physical components of a set of pottery sherds, or a faunal data). Like more standard journal publications, data papers can be peer reviewed. The short text describes the data set, its contents, and methods for collection as well as guidelines its use and potential for re-use. Publishing data sets is a new way to publicize and share your work that is still novel in the sciences. Now there are two archaeological journals leading the way: Internet Archaeology and the Journal of Open Archaeology Data (JOAD). Both journals are peer-reviewed and publish data papers so that they are openly accessible online. Importantly, both journals list tDAR as a trusted repositories where authors can submit their data sets to ensure their long-term accessibility and preservation. The move towards publishing data sets is an important for archaeological development. Archaeological projects typically do not move digital data into repositories where they are accessible and securely stored. Additionally, few institutions provide proper digital curation, such as archaeology specific metadata, which assures long term preservation for future uses. tDAR couples domain specific knowledge with solid digital preservation practice to provide a place for archaeologists to store and share their research, including datasets. For more information on submitting a data paper to Internet Archaeology, visit their information page. For an example of a data paper in Internet Archaeology, have a look at Wynee-Jones and Fleisher’s paper Ceramics and Society: Early Tana Tradition and the Swahili Coast. For more information on submitting a data paper to JOAD, visit their submission page. (The page also includes a great graphic representation of the publishing process). For an example of the data papers published in JOAD, you may want to have a look at Andrew Pearson’s Dataset to accompany the excavation report for a ‘liberated African’ graveyard in Rupert’s Valley, St Helena, South Atlantic. Copyright © 2017 Digital Antiquity. Design Credits.